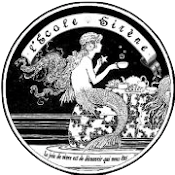 Siren School is readying for its Grande Opening and inaugural season, which takes place at the time of year in which are celebrated Beltane, May Day, and Spring's promise of new life. In Britain, the festivities attending the advent of Spring have a century-spanning history. Beltane, originally a Celtic observance, marked the end of winter and the coming of summer and the cattle were turned out to their summer grazing pastures. 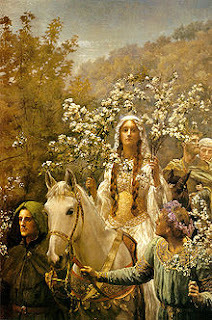 During Britain's subsequent Roman occupancy, a May feast worshipping Flora, the goddess of flowers, and Maia, the goddess of spring for whom the month of May is named was introduced into the seasonal mix. The mixture of these celebrations became May Day, along with the traditions that accompany it. 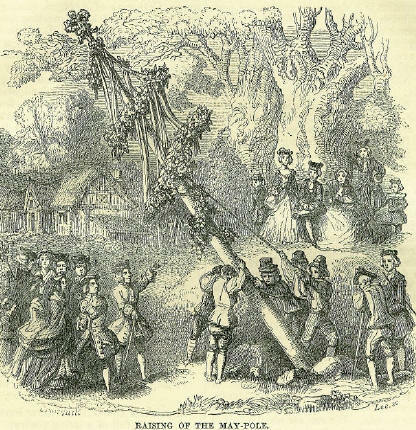 The term "bringing in the May" referred to going out into the woods and fields on May Eve (April 30), to gather flowers and foliage to be used as Maypole decorations. It also offered the opportunity for amorous trysts while the 'mayers' were unchaperoned at night in the woods. By the Middle Ages, a Maypole could be found in virtually every English village. Originally, they were denuded trees, awaiting decoration by the revelers. On May Day itself, the Maypole served as the focal point for the event's dancing and games... rather like the gathering of people in Time Square on New Year's Eve. 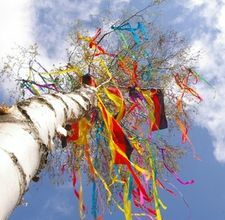 Based on the trending religious proclivities and morality of the generations since, Maypole festivities have waxed and waned in popularity. In recent times, Maying was embraced by middle-class Victorians who longed for the pleasant joys of a simpler time. In their hands the celebration was stripped of its more hedonistic elements and repackaged as a sweet little children's activity. That is when the Maypole became attached to ribbons and Morris dances. Scholars have suggested that the exaggerated leaps typical in Morris dancing, were used to promote crop growth, just as the Romans once attempted with the clashing of sticks representing the battle between Summer and Winter. The foregoing touches on just one aspect of the rich, impassioned and symbolism-laden celebration of Spring's coming. It is a practice that has traveled across both centuries and continents. And it is one to which we hope to do justice as we bring in the May each year to kick off our school term.